The MTX108 commercial grade LED Floodlight Projector (RGB) can illuminate large scale architecture, building facades, structures and sculptures and large-scale wall-washing throwing an enormous amount of light. Limelight has installed these units to illuminate 50 metre high mature gums trees from a 30 metre distance and the MTX units absolutely bathed the trees in a wash of pure saturated coloured light. The entire parkland was transformed into a coloured lighting display from 12 units mounted onto six light poles. An amazing display of light output from the Limelight MTX108 series of LED floodlights. The units are DMX addressable, 0-100% dim-able and have a very unobtrusive industrial appearance allowing them to blend into any existing architectural facade, light pole, bridge, retaining wall, – without taking from the original architectural design intention. Link the units together to create a ground wash array or install them individually to highlight and target specific features. The units are available in narrow 15 degree, medium 35 degree or wide 45 degree formats to suit a multitude of design ideas and applications. The Limelight MTX108 LED floodlight projector is the perfect choice for any medium to large scale exterior lighting application requiring a huge splash of colour from a reliable, intelligent, workhorse that will focus everyone’s attention on the lighting display and have the lighting fixtures nicely sit in the background as a stylish accompaniment. 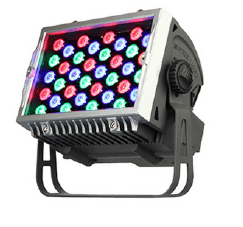 In addition, these fittings are available with various beam angles, mounting configurations and LED colour output options including RGB and DMX control.